Like new movies, plays or performances, there are many books that demand attention each season. Some are much talked about but can soon be forgotten; others step modestly into the limelight and miss the applause that they actually merit. Released with little fanfare two years ago, Arctic Spectacles is a magnificent polar book that deserves the highest ovation. I first read some manuscript chapters long before it was published, whilst labouring with my own doctoral research. Potter was well known to collectors and lovers of nineteenth-century print culture for his intriguing web-museum – a trove of obscure polar ephemera, reassembled into a cabinet of online curiosity, to help students explore the Franklin tragedy – but it is only recently that this insatiable cultural approach has entered the academic mainstream. Through engravings, caricatures, magic lantern shows, from rolling panorama to implausible theatrical spectaculars, we can encounter the growing public appetite for expeditions amid the perils of the icy North. But, before we rollick among gorgeous polar playbills and other visual delights, it seems right to begin with the bears. Sir Edwin Landseer’s haunting critique of polar ambitions, Man Proposes - God Disposes, continues to challenge our imagination. Displayed in public for the first time in 1864, people cried when they saw it. There are no heroes on the ice, just the wreckage of a ship, a chaotic tumble of icebergs, and a polar bear chewing on the Union Jack: a hostile Arctic consuming human failure. The Times praised its originality in grasping at ‘the heart of … ferocity and desolation’. The critic William Rossetti gushed that animal painting had now ascended to a new and glittering empyrean. Yet others found it utterly unpalatable, purging their distaste by writing letters to the press. The Illustrated London News declared the painting ‘too purely harrowing for the proper function of art’. Yet, of course, the delight in art - as in theatre, film, or a polar book - is that art draws a range of opinions. Far from the scandal of this first Royal Academy show, the painting returned to fashionable prominence for the winter exhibition of 1874 as metropolitan eyes were turning again to the North. A new British North Pole expedition departed Portsmouth with full pomp the following year. The painting sold at auction in 1881 for £6,615, a record price for the artist that held for over a decade. One discovers the canvas gracing the halls of the Exposition Universelle in Paris in 1878; it appears in the polar section of the Court of Heroes at the Wembley British Empire Exhibition in 1925. More recently, it appeared in the V&A material culture extravaganza Victorian Vision and in 2005 the Carnegie Museum lead the bloodthirsty bears out into the public arena again for Fierce Friends, an exhibition which showcased the relationship between artists and natural world. In 2008, I used the image as a point of discussion in the BBC documentary Wilderness Explored – the painting providing a taut historic counterpart to the very latest in Arctic visions, in this instance some superlative wildlife cinematography from the BBC Natural History Unit. But why this bite-sized account of the wanderings of a painting? Well, in his long-awaited, and beautiful book Arctic Spectacles, Potter employed these ravenous beasties on his front cover. I wondered why this was, when there were so many other nineteenth-century polar images he could have chosen – such was the explosion of visual culture during this period. Quite simply, it was one of his favourites. Certainly it was, and is, a powerful image. It has a recurring resonance, but as Potter had access to so many other rare and unique visuals, why cram these familiar bears into an imagined lanternslide? Well, the conceit is soon clear. We are reminded that the image has travelled far over the years, inspiring different responses from different audiences. The bears are often put to use. The image has been hidden in a corridor, honoured at functions, gobbled-up by picture researchers to decorate television programmes, projected on lecture screens aboard polar cruise-ships, cut-and-pasted into school projects. It provides a good example of the way that tastes (for art, as much as for exploration) can change. Reacting to the tragedy of the missing Franklin expedition, Landseer had found material for a biting satire about the vanity of human effort. And that’s the heart of Potter’s book – gauging the way that polar exploration seized public imaginations and how its visual vocabulary was drawn from wide sources of inspiration. Like Landseer, individuals respond creatively in varied, often surprising ways. Sometimes the reactions were straightforward – passing interest perhaps gave way to mild adulation for the returning explorer-heroes. On other occasions ridicule and criticism was heaped heavily upon weary shoulders like a sudden snowfall. Yet interest in exploration would often melt away as quickly as it appeared, the vogue shifting elsewhere. In London alone, it is worth remembering how many people and organisations were indifferent to the promise of exploration, and that many vigorously condemned the idea of a journey to the North. Some mounted effusive exhibitions in honour of their polar heroes; others wrote comic songs poking fun at their failings. Potter chronicles these fluctuating tastes with a vitality that the subject deserves. His research has energy and playfulness. Far from the deadening slowness of months stuck, ice-bound in winter-quarters, polar explorers returned home to a riot of colour, show and spectacle, applause and acrimony. Our polar history writing needs to take stock from this and embrace the eclecticism and cultural vibrancy of varied source materials. Arctic Spectacles is not definitive, but that was never the aim. Where is the enjoyment in that? Potter draws back the curtain, reminding us of the possibilities within private and public archives, inviting future researchers to join him and step inside. There is a useful ‘check-list’ of shows and entertainments to guide the newcomer to this material, but one can add to it fairly easily now, with web access to new archives, and ever more accurate electronic searching aids. It is still a case of having to know where to look, sure, but great material seems to insist on surfacing in places where least expected. The Internet has not imperilled serious research – it has vitalised it. I have spent the last five years or so in collections across Britain and North America and electronic catalogues, as much as very tolerant archive staff, have made it possible to find much new material. Fresh leads appear in the ice, even within subjects familiar to seasoned polar historians. In the last few years I have been able to discover delicious details about new Arctic spectacles. In 1818 Barrymore’s melodrama The North Pole opened at the Royal Coburg Theatre, with a fully rigged ship ‘effecting her passage through floating islands of ice’. Charles Dibdin cavorted fashionably amongst the ice during the Christmas pantomime at the Theatre Royal Drury Lane over the festive season of 1820. The nautical melodrama Captain Ross; or, the Hero of the Arctic Regions opened in 1833 at London’s Royal Pavilion Theatre, and before long its motley crew of characters journeyed to stages in the provinces just as they were crafted into toy theatre miniature-heroes for parlours and nurseries across the country. We can now add a number of Alexandra Palace spectaculars to an expanding list, also the Royal Naval Exhibition of 1891 - unsurpassed in the quality of its polar artefacts - and Hagenbeck’s zoological entertainments with Nansen’s polar exploits performed before icy dioramas and dancing bears. The playbill of nineteenth-century polar performances increases all the time. Moving beyond official travel narratives and commonplace journal and press reviews – the main fodder of past polar histories, looking to provide ‘period context’ – there is a feast of material now available to help us better understand changing public interests in polar explorers. Without giving due attention to these types of primary, yet often ephemeral, sources a claim of ‘examining public imaginations’ falls very short. Potter succeeds where others have just made gestures. There are many individuals with new stories to be told and this book introduces a cast of odd and interesting souls to grace any melodrama. But there are countless coves yet to be met. We not need restrict ourselves to the famous, but be energetic in search of the obscure and the neglected. As Arctic Spectacles developed Russell and I chanced upon the showman-explorer John Cheyne, madcap aeronaut and polar lecturer. There is still more to learn about him, the few people who thought his balloon plans quite brilliant, and the great many for whom he was thought nothing short of an implausible and dangerous lunatic. I am now intrigued by the American showman Jean Paul Wolfstenberger, whose Mirror of the Arctic is said to have wowed audiences in London sometime before 1860. I smile and imagine Mr Rignold’s colossal moving panorama, which dominated seaside coffee halls in the 1870s. Or, what of Urio Etwango, a Greenlandic Inuk who willingly journeyed to Dundee in 1886 to experience the undoubted joys of a Scottish winter? I want to know more about the Inuit Tookoolito, Ebierbing and the young boy Haralukjoe, presented to Queen Victoria at Windsor Castle in 1853. I try hard to understand the semiliterate Yankee whaler Samuel Hadlock Jr who forced two ‘Esquimaux’ from Baffin Island, displaying them as trophies at the Egyptian Hall in London. Clearly, there are new heroes and villains to be found in the pageant of nineteenth-century exploration. Like the many spectacles that Potter features, this book has generated differing responses from its audience. Some critics have overlooked its original approach whilst a few have been cruel in their misunderstanding. Yet, the Journal of Popular Culture rightly declared it a ‘ﬁne study’, born through a decade’s research and collecting. Alaska History delighted in its ‘revealing and thought-provoking’ narrative. If something of academic jargon-ese were necessary, then I would praise Potter’s attention to the performative aspects of polar exploration within the theatre of public tastes. 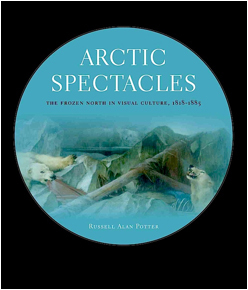 Put more simply, this is the most enjoyable study of Arctic visual fascinations yet published. We are encouraged to look beyond the pole, beyond a monotonous account of the daily events of exploration life, to consider a broader, more nuanced, and joyously more colourful culture of exploration – as told by its showmen, performed in theatres, reported in newspapers and read by the fireside. If one moves to consider travel, adventure, photography and motion pictures too, then the range of spectacles before us is almost limitless.